IREX is currently accepting applications for Fellowships in Research Management from Armenia, Belarus, Georgia, Ghana, Kenya, Moldova, Nigeria, South Africa, Uganda, and Ukraine. The deadline for applications is April 8, 2016. Full eligibility requirements and application instructions are provided via the link below. Please read the instructions carefully before submitting the completed application form and accompanying documents to uasp@irex.org. The application form can be downloaded below. 1. Fellowships in Research Management. IREX provides competitively awarded short-term fellowships for mid- and senior-level university research managers and ministry officials to spend approximately seven weeks in the US. 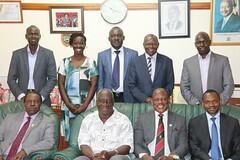 Four of these are with counterparts at respected US public universities to analyze and to observe operations in their assigned US research management offices, as well as other host university divisions. This is bookended by three weeks of intensive training and facilitated reflection in Washington, DC. While in the US, fellows are required to prepare a Research Management Comparison Study on a research management issue relevant to development needs at their home institution. The studies are then published on the IREX website.